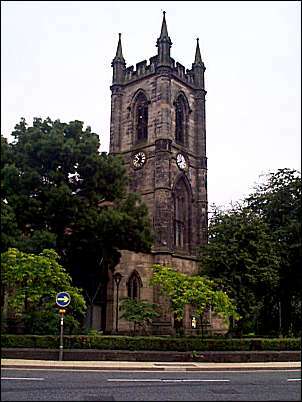 Description: 1826-30, Architects: Trubshaw and Johnson, Ashlar, Gothic style. Minster Church. 1826-1830 by Trubshaw and Johnson. Renovated inside in 1888. Ashlar faced. Commissioners Gothic style, with west tower, nave and two isles, chancel. West tower of 3 stages with polygonal angle buttresses forming pinnacles to parapet which also has blank traceried battlements. Simple chamfered arch to west door with hood mould carried on corbel heads. 3-light window with transom over, clock, and paired lights to bell chamber. Door in flat porch against south wall. Aisles divided into 5 bays by buttresses with crocketed pinnacles. 3-light traceried window with transom in each bay with stained glass in lower panels. Chancel of 2 bays with large polygonal angle buttresses, and 5-light Perpendicular style east window. Interior reported as having Saxon font, stained glass east window by David Evans and monuments including those to Josiah wedgwood by Flaxman (Relief portrait medallion), Josiah Spode II and John Bourne. 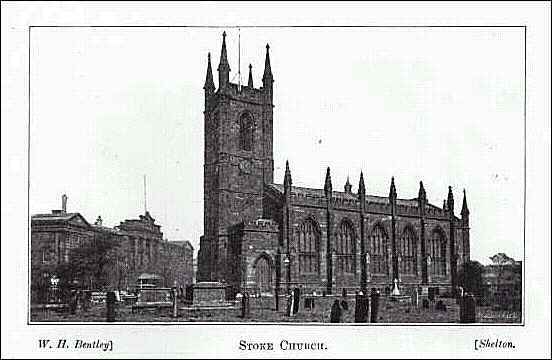 The Buildings of England: Pevsner N: Staffordshire: P. 262). Taken from a 1893 trade journal. Picture taken from St. Peters church yard. The Town Hall is in the background and Glebe Street runs between the church and Town Hall.